Flavor text The worst part is the singing. 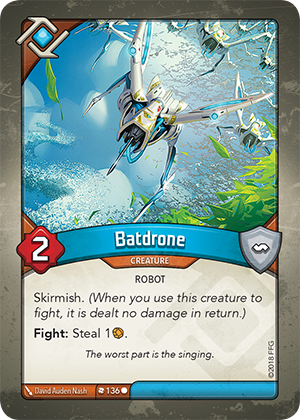 If Batdrone attacks a creature with the Hazardous keyword, does Batdrone take damage from the Hazardous effect? Does Batdrone steal Æmber if it is destroyed during a fight? No. Batdrone only steals Æmber if it survives the fight. What happens if Batdrone fights and my opponent has no Æmber to steal? Batdrone steals no Æmber for that turn.